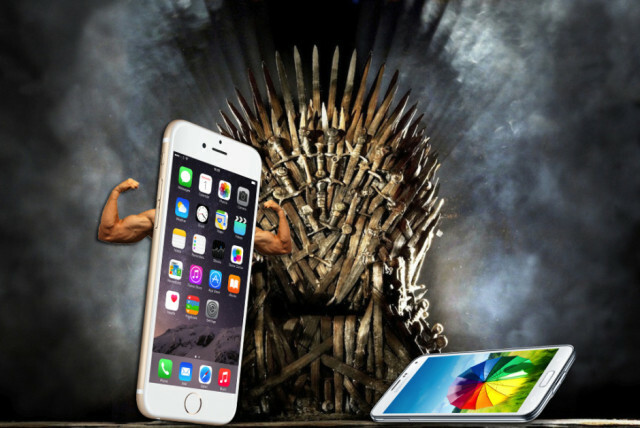 Of the smartphone stories which played out in 2014, two of the biggest were the triumph of Apple’s iPhone 6, which sold a massive 10 million+ units in its opening weekend alone, and the faltering of Samsung, which fell from the dominant position it had enjoyed since 2011. Today, a new report from Gartner (paywall) breaks down both the 1.2 billion smartphone sales that took place worldwide last year, and also the sales from Q4 2014 — revealing how Apple leaped ahead in the smartphone category, while the South Korean tech giant Samsung started to lose its footing. Make no mistake about it: this was the year everything changed. As expected, the last three months of 2014 is where the clash between the two companies was at its fiercest, on account of the fact that the iPhone 6 didn’t ship until late September. During the final quarter of the year, 367.5 million handsets were sold in total worldwide — with Apple selling around 75 million devices to Samsung’s 73 million. Although that’s not the biggest gap imaginable, it marks a significant break from the previous year where Samsung sold more than 83 million smartphones and Apple sold “just” 50 million. Apple gained considerable ground in both China and the United States, with Chinese sales up 56 percent and U.S. sales increasing by 88 percent. Samsung didn’t fare so well. There’s no doubt that Samsung had a disappointing 2014: losing market share for three consecutive quarters thanks to the extra competition the company now faces. Samsung wildly overestimated the appeal of its Galaxy S5 handset, missing projections by 40-50 percent, and was squeezed at both ends of its customer base by the rise of low-cost companies like Xiaomi and Apple at the top-end. The lower end of the market is visible in Gartner’s report, with three of the most notable improvers being Lenovo, Huawei and Xiaomi — although even combined they do not represent the same market share percentage as either Samsung or Apple. “With Apple dominating the premium phone market and the Chinese vendors increasingly offering quality hardware at lower prices, it is through a solid ecosystem of apps, content and services unique to Samsung devices that Samsung can secure more loyalty and longer-term differentiation at the high end of the market,” writes Gartner’s research director Roberta Cozza. Whether Samsung can do this, of course, remains to be seen. While some reports show that Samsung appears ready to beat a tactical withdrawal from low-performing markets altogether, perhaps re-imagining itself as an Internet of Things company, other moves suggest that Samsung is getting back to what it does best: copying Apple in every conceivable way, from handset design to EarPods to ecosystem. Hey, it worked in the past, didn’t it?